Quick Thaw is an ice and snow melter with a slight blue tracer dye. 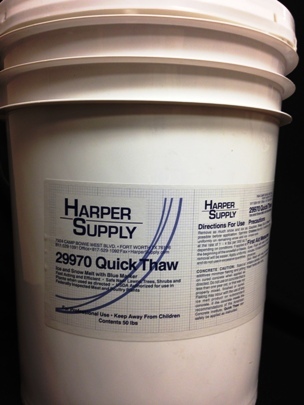 Quick Thaw is the most economical ice melting product that Harper Supply carries. Fast acting and efficient, is safe to use near lawns, trees, shrubs and plants when used as directed. Quick Thaw is USDA authorized to use in Federally Inspected Meat and Poultry Plants.